CyberneticZoo.com is a web site dedicated to the history of cybernetic animals and early robots. I came across Cybernetic Zoo while searching for pictures of Shakey the Robot, which was developed by Stanford Research Institute in the late 60s and early 70s. It was claimed by SRI that Shakey was the first robot who could reason while solving simple commands such as “Shakey, pick up the box on the table.” I was fortunate to have seen a demonstration of the robot at SRI when I was working in a nearby lab. I was suitably impressed, but never imagined where the continued development of robot technology would lead. SRI’s Artificial Intelligence Center (AIC) developed Shakey over a six-year period beginning in 1966. The first mobile robot to visually interpret its environment, Shakey can locate items, navigate around them, and reason about its actions. Named for its erratic and jerky style of movement, Shakey stands six feet tall and is equipped with a TV camera, a triangulating range finder, bumpers, and a wireless video system. 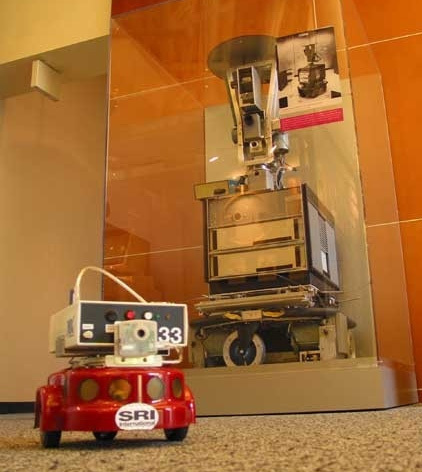 Today, the robot resides in the Computer History Museum in Mountain View, CA. The Computer History Museum will open its doors on Jan. 13, 2011 with an inaugural exhibition called Revolution—The First 2000 Years of Computing. While you’re there, don’t forget to visit Shakey. It is a machine which, without any apparent practical utility, is noticeable as a mechanical curiosity, about the size of the average man, and he struts up and down the room, or stops, with one foot gracefully elevated. This is a description worthy of notice by prospective authors of SteamPunk literature. Day 7: The Thinking Computer – Mind Inside Matter (Bertram Raphael) (1976) Note: Shakey’s history is given on pages 275-288. This entry was posted in Non-fiction and tagged postaday2011. Bookmark the permalink.